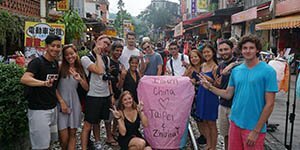 This groundbreaking programme enables students to complete a placement year in Taiwan. Alongside the minimum working hours required to accredit the placement, we work with the student, their university and you (The host company) to ensure placements fulfill their academic requirements and help your company further it’s business with their expertise and hard work. Internship candidates from all over the world. Most of our applicants are from the UK, Europe, Australia or North America. On place 24 hour support for the interns from our friendly international staff. A bespoke service for you to make sure you get your perfect intern. With no pressure or obligation to accept a candidate. InternTaiwan assists the interns to source and manage their accommodation in the city. Comprehensive orientation upon arrival along with a welcome pack and guidebook. Pre arrival support with visa guidance and flight and insurance advice. We will provide the invitation letter so you don’t have to. The host company pays InternTaiwan absolutely nothing. We do not charge the partner companies for our services. We organise regular dinners, trips and activities for the interns so they are comfortable and having fun in the city. Get in touch and we can have a face to face meeting to discuss potential internship positions and answer any questions you might have. Once we have applicants for your position we will send you their CVs and help you arrange a Skype interview. Accept your perfect intern and we will help them organise their working visa (Youth mobility visa) allowing them to work in Taipei for up to one year. Once in Taipei we will pick them up from the airport, give them an orientation to the city, help them apply for their ARC permit and also assist them with finding accommodation. We will then personally bring the intern to your company to help the introduction process run smoothly. We will also provide ongoing support to the company if any problems arise. If you would like to host interns in your company please don’t hesitate to get in touch with us! We are always looking for new companies who can offer great internship experiences. Our focus has been to arrange internships in China for European & North American students and graduates. Pagoda Projects provides programmes for over 500 people every year in exciting destinations around the world, which means we can find a suitable intern for your company that both meets your expectations and adds value to your business. As we receive a fee from applicants, their university or a government-funded organisation on their behalf for successfully arranging their internship and providing support, we deliver this service to your company free of charge, with absolutely no hidden costs.